The NHL suspended three players the night after the biggest NHL brawl in recent memory...but was it enough? Check out Alex Sibley's take on the night of fights. The only thing missing from Friday night's fight-filled game between the New York Islanders and Pittsburgh Penguins was Reggie Dunlop directing the Hanson Brothers on which skater to fight next. The difference is that Slap Shot was funny. Friday's game was an embarrassment. When the dust finally settled and the trainers were done picking up the gloves and sticks off the ice, which might as well been a boxing ring, there were 15 fighting majors, 346 penalty minutes between the two teams and two Penguins left on the bench when the final horn sounded. If it couldn't get much worse, Mario Lemieux issued a statement Sunday bashing the NHL and saying that he might get out of the game if that's the product the NHL wants to put on the ice. First things first, Mario isn't going anywhere. He's sitting on a gold mine in the Steel City and his team has the star power to be contenders for the next five or six years. But Lemieux was spot on in his statement, which was issued after the league handed down suspensions to one Penguin (Eric Godard) and two Islanders (Matt Martin, Trevor Gillies) for their actions during the game. Godard was issued an automatic 10-game suspension for leaving the bench when Islanders forward Michael Haley engaged in a fight with Penguins goalie Brent Johnson early in the third period. But here's where the NHL dropped the ball. In the second period, Martin dropped his gloves and attempted to sucker punch Pens center Max Talbot in a scene that was eerily similar to the 2004 Todd Bertuzzi-Steve Moore incident in Vancouver. The Martin punch ignited the emotions that carried over from the previous game between the two, where Talbot landed a heavy, but very legal check on New York forward Blake Comeau. Comeau was shaken up on the play, but stayed in the game. Despite the obvious and deliberate attempt to injure Talbot with a shot to the head when he wasn't looking, Martin received just a four-game suspension. Three years ago, that makes sense. But not in this current NHL, where owners and players want shots to the head out of the game. James Wisniewski of the Anaheim Ducks and Calgary Flames Tom Kostopoulos were banded for six and eight games, respectively, for body checks, not punches, to the head of other players. Matt Cooke was suspended four games for a hit from behind earlier this month. Was it cheap? Of course. But it wasn't as cheap as a sucker punch. But I guess a check from behind and a punch are the same thing. So, apparently Colin Campbell, the disciplinarian of the league, is telling players that you can throw a sucker punch to the head and only get four, but if you throw a check with your arms raised, expect to sit for at least six games. Now, unlike Bertuzzi, Martin's punch didn't land. But what if it had? 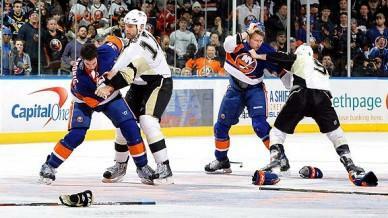 Better yet, what if the player on the end of the fist was Sidney Crosby? I highly doubt Mr. Martin would be sitting for just four games. But sadly in this debacle, that wasn't the worst incident that happened – and once again, the NHL didn't do jack in the aftermath. Early in the third period, Gillies targeted Pittsburgh's Eric Tangradi, darted from across the ice and left his feet to land a vicious elbow to the head, which caused Tangradi to stagger on his skates. But Gillies was just getting started. As Tangradi stood dazed and confused, Gillies dropped his laundry and began throwing punches before dropping Tangradi to the ice, starting yet another brawl in the game. Sounds bad, right? Gillies took it to another level as he stood in the door heading to the locker room and taunted Tangradi as he was being attended to by the Pens' trainer. It was a disgrace to watch. It's almost like he was an animal in captivity for years before the zoo let him out in the wild. All of that got him just nine games. The elbow itself was worth about 10, throw in the sucker punch and everything else, Gillies shouldn't have been seeing the ice for a long time. The league failed to suspend Haley, an Islanders' rookie who got in three fights, two of which in one stoppage, or Johnson, who instigated the fight with Haley by gesturing at him at the blue line as Haley was skating to the penalty box. All year long, we have heard how the owners and the NHL brass want the cheap hits and fights out of the league. There have been numerous meetings with the owners with head-shots being the main topic of discussion. This was the perfect time to take a stance, come down hard on all the players and both organizations and make sure that actions like this don't happen on a regular basis. Instead, Gary Bettman and everyone involved folded. They took the easy way out. The only fine went to the Islanders, who will lose $100,000 for their actions, which is a joke in itself. It takes two to tango, and it takes two teams to have a game like that. Did the Islanders initiate most of the events on this dark night for the NHL? Absolutely. But did the Penguins back off and try to extinguish their actions? Absolutely not. Both organizations should have been fined the same amount of money, but it appears that they don't want to make Mario angrier than he already is by fining his team. I guess when your owner is a legend, his wallet is untouchable. These two teams meet again in Long Island April 8. If anything, the NHL has opened the door for another evening of brawls and cheap shots. If you want the game to change, you have to take action, not turn the other cheek and pray like crazy that another night like this won't happen.